The HF03 is a heat flux sensor that can be used in mobile applications. It is combined with LI19, a high accuracy hand-held read-out unit that can be used both for mobile measurements and as an amplifier directly connected to a PC. The combination HF03 / LI19 is typically used to study heat flux levels around flares and fires, and to calibrate flare radiation monitors / flare heat flux sensors. LI19 is used to display the measured flux level; for attaining that, the sensitivity of HF03 is entered into the LI19, by programming it using a PC. USB connection is part of the delivery. Software should be downloaded (this is to ensure that the latest version is applied). The LI19 is battery powered, using 2 AA-type batteries. These are included in the delivery. Batteries allow 50 days of operation. HF03 / LI19 is not rated for EEx environments, nevertheless it is admitted in many cases, because the instrument operates on 3VDC only. Extended cable. Standard length for mineral insulated cable as well as plastic cable is 3 m. Both can be extended up to 200 m.
Sensitivity: In case the electronics accuracy is not sufficient, the sensitivity of the heat flux measurement can be increased. Shielding options: sensor and mineral insulated cable connected to shield is standard. Not connected can be offered as an option. 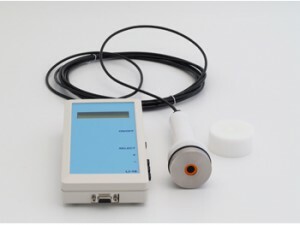 Compensation and calibration: Hukseflux can provide solar radiation sensors (for solar radiation compensation) as well as portable heat flux sensors type HF03 (for calibration).